LibreOffice’s Start Center is the document management system for the office suite. Through it new documents can be created, documents can be opened, and information about the office suite can be accessed. It ties the six different applications and different types of documents together. It gives visual icons of the recently opened documents that the individual applications don’t show. It also is the fastest way to access document templates for creating new documents. These are a few of the things that can be done from the Start Center. This is an image of LibreOffice StartCenter, running in Mint Linux. StartCenter looks about the same and has the same menus, regardless of whether it is running on a Linux distro, Windows, Mac, or another desktop operating system. Start Center is launched by clicking the white icon called LibreOffice in any operating system. This page gives a basic overview of each one of these. Click an item in Page contents to learn more about the specific feature of Start Center. LibreOffice has six applications. A new document for each application can be created from the Start Center. This can be done by clicking the File menu, highlighting the New sub-menu, then choosing the desired document type from the menu. It also can be done by clicking on one of the icons for an application under the Create section in the left column. However, the New sub-menu under the File has more options than the Create section. Click on the desired document type in either list, and the new document will be created in the appropriate application. 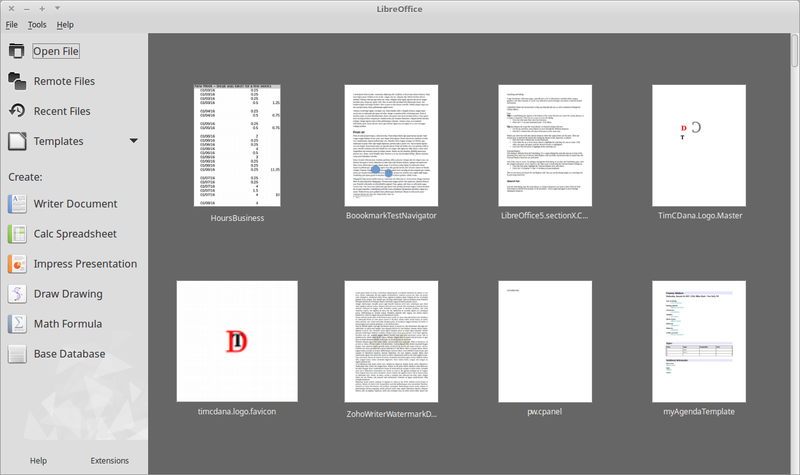 LibreOffice keeps track of the latest documents that you opened. In the Start Center, icons of them are listed in the large right column. This list of documents is connected to the Recent Files item in the left column. However, clicking Recent Files doesn’t change the right column. Under the File menu, there is a Recent Documents sub-menu. Highlighting this shows a list of recently opened documents. Click on the desired document to open it. In addition to opening a recent document, the Start Center also allows you to find documents on your hard drive. It does this through your operating system’s Open dialog. There are two ways to access the dialog. Either click the Open File item in the left column or click the Open item in the File menu. The typical Open dialog has standard folders listed in a left column and the contents of the selected folder in the large column to the right of it. There also is usually a drop-down menu to change the selected folder. The Start Center can open a dialog where you can connect various kinds of remote servers. The dialog is covered in the following page on this Website. The dialog can be opened by clicking Remote Files in the left column or by clicking the Open Remote Files item in the File menu. LibreOffice has eight wizards that can be used to create a document. A wizard opens a dialog before the document can be accessed to help you set up the document. These can be templates that you base future documents on. Letter: This helps you create a template for a business, formal personal, or a personal letter. Fax: This helps you create a template for a business or personal fax. Agenda: This helps you set up a document for an event or a meeting that lists the different sessions or the topics being discussed. Web Page: The dialog lets you choose documents from your hard drive to create a Website with and converts them to an HTML or PDF format. It will also create a table of contents or navigation for the documents. The documents can be opened by a standard Web browser. Document Converter: This converts Microsoft Word, Excel, and Powerpoint formatted documents to OpenDocument formats. Euro Converter: Converts the currency amounts found in LibreOffice Calc documents and in fields and tables of LibreOffice Writer documents into euros. There is a drop-down menu to select the currency that needs to be converted. Address Data Converter: This allows you to find an address book in your computer and insert the data into a spreadsheet. Templates are documents that are used to create other documents with the same fonts and formatting. There are templates for Writer, Calc, Impress, and Draw documents. They are created by Wizards. You also can turn a document into a template by clicking the File menu, highlighting the Template sub-menu, then clicking Save As Template. You can select a template that you created, one that is included with the office suite, or one that you download from libreoffice.org. There are also options to reorganize and edit the templates. To access the templates click the templates drop-down menu in the left column or select the Templates item in the New sub-menu in the File menu. Edit Templates: This opens the Template Manager that allows you to edit, reorganize, and import templates. When you click on the File>New>Templates the Template Manager dialog appears. Help dialog descriptions and instructions on many features in LibreOffice. It can be accessed by clicking the Help button at the bottom of the left column of the Start Center or by accessing it through the Help menu: Help>LibreOffice Help. Extensions increase the functionality of LibreOffice. These can be installed through the Extension Manager. The Extension button at the bottom of the left column of the Start Center launches the extensions section of the LibreOffice Website. If you click the Tools menu then Extension Manager, the Extension Manager dialog opens. LibreOffice has a dialog that allows you to edit the items and features in Start Center. It can be opened by clicking the Customize item in the Tools menu. The Options dialog are the settings for the entire LibreOffice suite. In Start Center, the Options item is under the Tools menu. LibreOffice Help: This opens the help section of LibreOffice’s Website. There is also a documentation plug in that can be installed, so when you click this item will ope a LibreOffice Help. Send Feedback: This opens the Get Help section of libreoffice.org. This has links to a forum to ask questions and report bugs. License Information: This opens a dialog that gives a basic overview of the license and gives you a link to the full license. About LibreOffice: This opens a dialog that gives you information about the version of the suite you are using and gives you a link to libreoffice.org. For the Mac version, this item is found by clicking “LibreOffice” in the task bar. Check for Updates: Only the Mac version has this in the Help menu. The Windows version puts an icon in the right of the bar, just below the menus.